How to download videos from Daum.net on Mac or Windows? Easy to download Daum videos to MP4, AVI, MOV, MKV, WMV, FLV, MP3, WMA, M4A, etc. Have you tried to look for software to download videos from Daum.net? Would like to capture some news in South Korea? Daum is the first Korean web portal of significant size. If you want to download videos from Daum.net, you come to the right place. In this article, we will show you a powerful online video downloader - Bigasoft Video Downloader pro and a detailed guide on how to download Daum news videos for playback without internet connection. 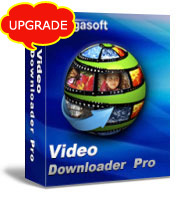 Bigasoft Video Downloader Pro is one of the top ranked software that includes the functions of video downloader, recorder and converter. It helps to download videos from Daum.net as well as other video sites, like YouTube, Yahoo, Facebook, Metacafe, Vimeo, Livestream and convert online videos to any portable player, mobile phone or tablet. Besides downloading videos from video sharing websites, Bigasoft Video Downloader Pro also allows you to record live streamings and save them to MP4 format. How to download videos from Daum.net? Firstly, please download the free trial version to try to download videos from Daum.net. Bigasoft Video Downloader Pro is fully compatible with the latest OS, including Windows 10 and Mac OS X 10.11. More than 100 video streaming/sharing sites are supported, including YouTube, Facebook, Livestream, Vine, Dailymotion, VEVO, Yahoo, Lynda, Crackle, NicoVideo, YouTube, HBO, HGTV, Blip TV, 9Jumpin, CTV, Facebook, CBS, SBS, etc. Download and convert Daum.net videos to playback on android, iOS or other media devices in one click. Download and convert online videos for editing with Windows Movie Maker, Final Cut Pro, iMovie or embed them to PowerPoint or Flash. Batch downloading playlists is easy with Bigasoft Video Downloader Pro. No need to add scripts for Web browsers. Totally clean and safe. Embedded video/audio converter and video recorder. Search for the Daum video which you like to download and convert, and then copy the URL of that video. Then go back to the download panel of Bigasoft Video Downloader. The link address will be automatically pasted to the URL box. Click "Save Folder" button to choose the destination folder for the downloaded Daum video. If you prefer to save the Daum video to compatible format for your iPad, iPhone, tablets or other editor programs , please check the "Automatically Convert to" option, and then click the drop-down button on the right side of the "Automatically Convert to" to select output format. Click the "Download" button to start and finish downloading and converting Daum. After it is completed, click the "Save to:" destination folder link to open the "Convert" folder to find the downloaded/ converted Daum news. Besides downloading Daum videos, Bigasoft Video Downloader Pro has more other features waiting for you to explore, like converting local videos/audios and extracting audio from video, changing audio volume, cutting online videos, etc. Just download and try now!